The ultimate digital jigsaw puzzle for modern hotels will be completed at the Xenia 2019 trade show! 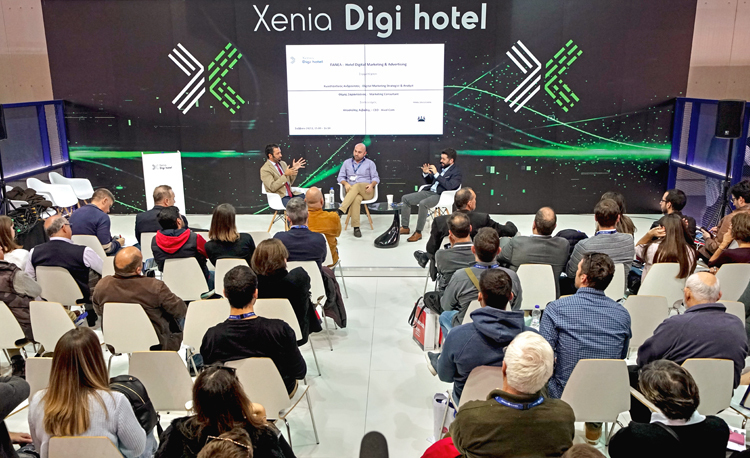 The Digi Hotel event will take place at a specially-designed area in Hall 3, during the course of the Xenia 2019 trade show and will feature topics such as strategy, sales, sites, content, OTAs, advertising, social media, distribution channels, reservations, and marketing, etc. For three days and following a comprehensive program at the largest and most significant event for the digital hotel sector, world-renowned experts from the fields of digital technologies, marketing and hospitality will consolidate all points of interest and best practices for sector entrepreneurs who wish to reap the rewards of the latest developments spearheading the digital revolution in the hotel industry. Through specific thematic sections, the speakers will analyze both the evolution of the habits of the modern traveler and how he behaves online, the digital path he pursues in his search for a hotel, as well as all the tools at the hotel’s disposal for its promotion to the appropriate audience, the proper sales channels to achieve it, the strategies, costs, and so on. Hotel executives will explain with the help of particular case studies how a hotel can achieve high rates of direct bookings through its site, and give advice on the proper management and distribution of digital channels. Content specialists will present all the best practices for the production of all kinds of content, as well as how hotels can capitalize on the free content produced by their customers. Online marketing, advertising and all the modern ways of digital promotion will be analyzed by expert speakers that will examine all the new tools available to hotels -especially the ways to target audiences and costs.